Benjamin Britten was a most reluctant public speaker. Yet his contributions were without doubt a major factor in the transformation during his lifetime of the structure of the art-music industry. This book, by bringing together all his published articles, unpublished speeches, drafts, and transcriptions of numerous radio interviews, explores the paradox of a reluctant yet influential cultural commentator, artist, and humanist. 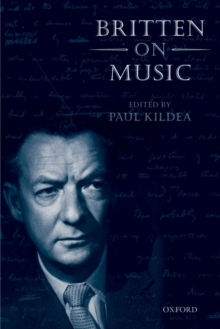 Whether talking about his own music,about the role of the artist in society, about music criticism, or wading into a debate on soviet ideology at the height of the cold war, Britten always gave a performance which reinforced the notion of a private man who nonetheless saw the importance of public disclosure.